Michigan Concealed Pistol License Tip: If you carry a concealed firearm, you will need to practice how to safely and quickly draw it from your holster. Depending on where you actually carry it, you will need to remove garments out of the way (e.g. shirt, coat, skirt, or dress), or open the housing (e.g. fanny pack, purse, or deep concealment holster) to have access. Drawing a handgun creates a liability concern that many gun ranges aren't willing to assume. As such, many do not allow shooters to draw on the premises. Thus, you will need to find a place where you can do so discreetly. For many people, handgun drawing practice is done in the sanctity of the home. 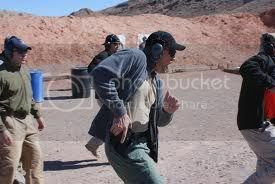 Furthermore, when practicing your firearm draw, be sure to practice scanning your environment for potential cover from incoming fire and moving towards it. In an actual defense, it is suggested that you "get off the X" by moving towards cover while drawing your firearm. If you practice doing so, your response during an actual defense will have been imprinted in your brain and increase the odds that you will act as you have practiced.